Force has a wide range of Knuckle Booms, also referred to as articulated booms. With 2 hinged sections, the Knuckle Boom offers an at height solution with greater manoeuvrability for those jobs which require reaching over and above obstructions. 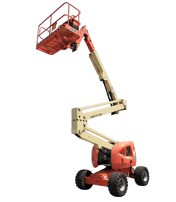 These lifts are available in electric and diesel and range in working heights from 30ft to 135ft. Our electric models are best suited for smooth, hard surfaces. And for those difficult jobsites with rough terrain the diesel model, which is also available in 4×4, is better suited. Another great feature of the knuckle boom lifts is the minimal to zero tail swing and that they are equipped with a jib which allows the operator to precisely position the work platform to achieve maximum work productivity and safety.